Caravanbrite have introduced a protective coating and fabric protector for caravans and motorhomes. 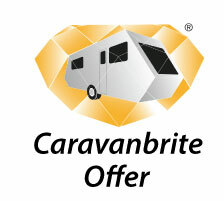 From the makers of Diamondbrite the product is applied to the external of the caravan. This is a two stage process and leaves the surface with a protective shield which prevents pollution and weathering damaging the paintwork. With just one treatment the vehicle will never need to be polished again. The vehicle is simply washed down using the Caravanbrite shampoo and conserver. There is then a further two stages applied and once treated will leave the caravan or motorhome with a high gloss finish and will remain fade and stain resistant. Also included in the treatment is the fabric protector. This stage of the process coats the seating areas and carpets with a special resin which protects them against spills and stains. Caravanbrite has been fully tested with tea, coffee, wine, fruit juices, chocolate and grease from many different foods. We are now offering this product at a price of £499. This also includes a lifetime guarantee, certificate and full aftercare kit including shampoo, paint conserver, fabric cleaner , alloy wheel cleaner and clothes and sponge.